Russian rabbinical scholar; lived in the first half of the nineteenth century. 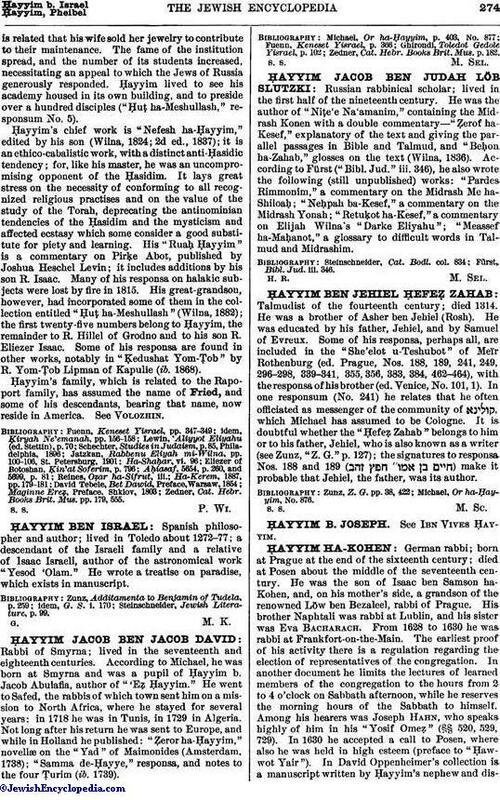 He was the author of "Niṭe'e Na'amanim," containing the Midrash Konen with a double commentary—"Ẓerof ha-Kesef," explanatory of the text and giving the parallel passages in Bible and Talmud, and "Beḥon ha-Zahab," glosses on the text (Wilna, 1836). According to Fürst ("Bibl. Jud." iii. 346), he also wrote the following (still unpublished) works: "Pardes Rimmonim," a commentary on the Midrash Me ha-Shiloaḥ; "Neḥpah ba-Kesef," a commentary on the Midrash Yonah; "Retuḳot ha-Kesef," a commentary on Elijah Wilna's "Darke Eliyahu"; "Meassef ha-Maḥanot," a glossary to difficult words in Talmud and Midrashim. Fürst, Bibl. Jud. iii. 346.